Ever since history teams under S.L.A. Marshall deployed to combat in World War II, the U.S. Army has deployed military history detachments to America’s wars. The mission of the Military History Detachment (MHD) is to deploy into theaters of combat in three-person teams consisting of one officer and two noncommissioned officers to collect historical data from Army units in the field. This data typically consists of oral interviews, documents, photographs, and artifacts. Together, this compilation becomes the official historical archives of the Army at war. What separates the MHD from other historians in theater is that MHD members are soldiers first, nearly all of them Reserve and National Guard soldiers, and they deploy into the combat arena and into harm’s way to conduct their missions. The lineage of the 305th MHD dates back to 1945 when the 60th Historical Team, Information and Historical Service, was constituted on 21 July 1945 in the Army of the United States. The 60th was activated in the Philippines on 9 August 1945, just before the end of World II, and served with the occupation forces before it was inactivated on 31 May 1946. The 60th was redesignated as the 305th History Team on 1 November 1948 and allotted to the Organized Reserve Corps. Over the years, the 305th went through several periods of activation and inactivation. On 24 November 1967, the 305th Historical Team was redesignated as the 305th Military History Detachment. In the weeks following the terrorist attacks on the United States on 11 September 2001, the 305th MHD was ordered into active military service on 1 October and participated in Operation Noble Eagle and Pentagon recovery operations. The 305th later deployed to Iraq between May and October 2003. In September 2005, the 305th was ordered into active service and sent to the Gulf Coast in support of relief operations following Hurricane Katrina. The 305th MHD was activated in July 2007 with less than thirty-day notice for deployment to Afghanistan as part of Combined Joint Task Force-82, Operation Enduring Freedom 06-08. The deployment would be the first coverage by an MHD in Afghanistan in over three years, so the mission was not only to conduct the traditional collection mission, but also to establish conditions for follow-on detachments to provide continuous coverage in the Afghanistan Area of Operations (AOR). The soldiers who deployed were Master Sergeant Richard Gribenas of Pittsburgh, Pennsylvania, Sergeant Julie Wiegand of Columbia, South Carolina, and Major David Hanselman from Williamsburg, Virginia. All three soldiers had deployed to war before, but they volunteered to stay with the 305th MHD in order to deploy as a team. The three soldiers were given only a two-week notice to put their personal affairs in order and report to their home station in Coraopolis, Pennsylvania, just outside of Pittsburgh. After one week at their reserve center to prepare their gear for shipment and one week of mobilization training at Fort Benning, Georgia, the 305th left Fort Benning and ended up in Germany for one week, waiting for a flight into theater. The 305th finally arrived in Afghanistan on 10 September 2007, and without any sleep, conducted their first mission—documenting the 11 September 2001 ceremonies at Bagram Air Field. The 305th MHD faced numerous challenges since it was going to an area where it would be responsible for a geographical region larger than the entire country of Iraq. While the Iraqi theater of operations included five MHDs, plus three to four additional civilian or military historians in theater, the 305th comprised the only history coverage in all of Afghanistan. Historically, the number of history detachments required in a region was dependent upon the number of troops deployed in that area. Whereas the Iraqi theater had approximately 150,000 troops, Afghanistan only fielded about 30,000 soldiers. This ratio made the number of MHDs appear comparable, but like so many other things, the two theaters of combat could not be compared so easily. The troops in Iraq were arrayed along major road networks and developed cities and towns. Massive bases housed the vast majority of U.S. forces in Iraq, and MHDs could visit a single forward operating base (FOB) and cover an entire battalion. Travel in the Iraqi theater was certainly hazardous due to the continual improvised explosive device (IED) threat, but the soldiers moved in heavily defended convoys along highways and paved roads from one major hub to the next. Using the frequent convoys or other transportation assets on the roads of Iraq or the numerous aviation assets, both fixed and rotary wing, available in Iraq to fly longer distances, the detachments had plenty of options for moving about the combat zone. In comparison, the roads of Afghanistan were few and far between. Not only was there a limited number of paved roads throughout the entire country, but many of those roads that were paved were unable to support the weight of Army trucks. In addition, they wound through mountain passes that were often too narrow for large military vehicles. These limitations greatly reduced the ability of U.S. troops to utilize ground transport and forced them to rely more heavily on air transportation. The great demand for air assets in Afghanistan had to be met by only one aviation brigade which was stretched beyond its capability to support all of the requests. These restrictions made it very difficult to move about a combat zone that was geographically the most challenging theater of combat in recent times. Mountain ridges rising up to over 14,000 feet bordered isolated valleys under constant threat of enemy attack with few roads and sparse population centers. The intense desert heat in Iraq was rivaled by the harsh summer months of Afghanistan, but the ancient, landlocked country also featured intense winter storms, frigid temperatures, heavy rains and snows, and even the occasional earthquake. All of these factors made moving about Afghanistan extremely difficult. Coupled with all of these challenges, the U.S. forces in Afghanistan were arrayed in remote FOBs and combat outposts. The 30,000 troops in Afghanistan found themselves covering a geographic region larger than the entire country of Iraq. Some remote bases were manned by platoons split in half that could be separated by an entire mountain range, making coordinated efforts impossible. Combat operations were centered on company and platoon operations, with the battalions and brigades merely providing support to locally planned operations. 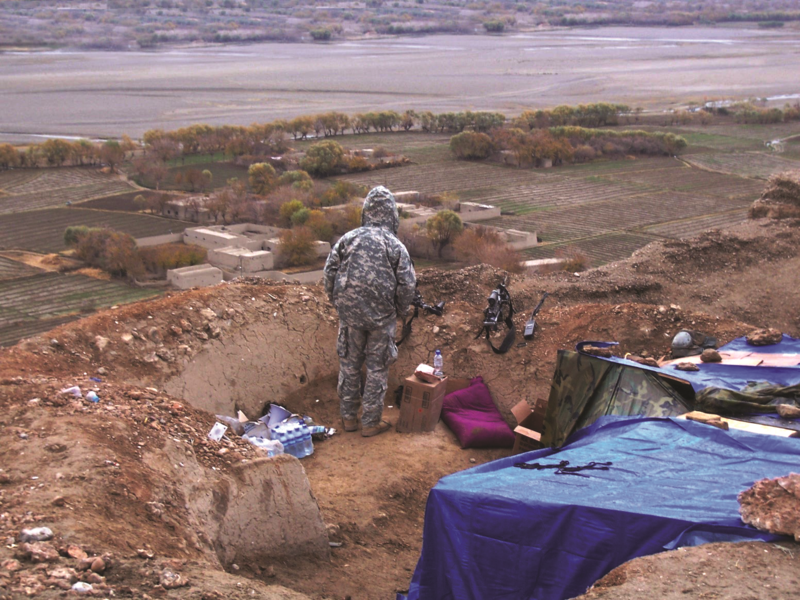 In order to properly document this war, the MHD in Afghanistan had to cover down to the company and platoon level. Added to these increased challenges for the lone MHD, there were no civilian historians or other military historians for the Army in theater. As such, the MHD commander jointly served as the theater historian for the Army. This additional task required the commander and his two NCOs to participate in senior level planning, briefings, and tasks at their home base of Bagram. All of this was in addition to being responsible for an area over sixty-five percent larger than any other MHD deployed. Within three weeks of arrival into theater, the 305th conducted its first extended “outside the wire” mission to northeastern Afghanistan. This thirty-day mission imbedded the 305th with the 173d Airborne Brigade Combat Team (ABCT) in the most contested regions of Afghanistan. 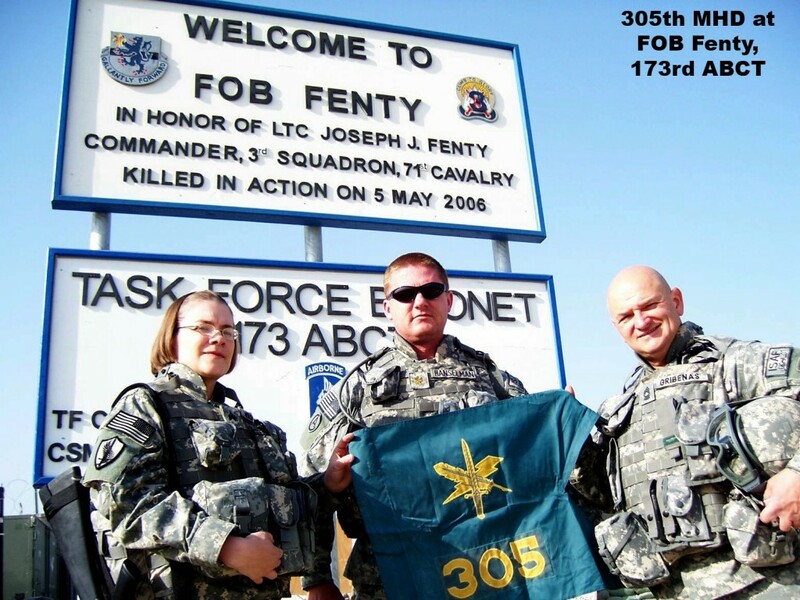 The 305th started their mission by covering the brigade leaders and key staff at FOB Fenty, Jalalabad. The senior leaders of the brigade welcomed the history team into their ranks and showed great enthusiasm for its efforts to document the operations of the 173d. The history team participated in the pivotal operation, Rock Avalanche, in the Korengal Valley, while visiting the 2d Battalion, 503d Parachute Infantry. Major Hanselman and Master Sergeant Gribenas were both cited for direct combat with the enemy (Hanselman’s second such recognition) when they were conducting interviews at the Korengal Outpost (KOP), home to Battle Company, 2-503 Parachute Infantry. The outpost came under direct attack by enemy personnel, and the two historians were compelled to serve as combat soldiers before being able to resume their interviews after the enemy had been suppressed and wounded personnel had been evacuated. During this mission, the soldiers of the 305th collected interviews, documents, photographs, and artifacts documenting the actions of the “Sky Soldiers.” Several soldiers who were interviewed were killed in action just days later in hard combat. Although the team took these losses hard, they only reinforced the importance of the mission to preserve the sacrifices of soldiers so that they would never be forgotten. Furthermore, many of the locations covered by the 305th will soon be familiar names in combat histories, such as the Ranch House, Bella, and the KOP in the Korengal. These intense battles led to recommendations for the Medal of Honor, the Distinguished Service Cross, three Silver Stars, numerous Bronze Stars for Valor, and even more Purple Hearts for the soldiers involved. The first mission of the deployment proved to be an incredible experience for the history team and made it popular topics of discussion back in the safe confines of Bagram every time members returned from a mission. The 305th MHD continued to deploy forward in November and December when it traveled to Regional Command-South and covered U.S. operations in southern Afghanistan. The work included participating in the second major combat operation, Operation Mar Karardad, the assault on Musa Qaleh. The 305th team imbedded with the aviation task force conducting the air assault and also covered the 1-508 Parachute Infantry of the 82d Airborne Division. Major Hanselman planned to cover U.S. forces from the beginning of the operation and to document it, from the initial planning through the execution of the largest combat air assault of the war. After participating in the air assault into Musa Qaleh on 7 December, members then imbedded with the paratroopers on the ground and weathered harsh storms and enemy action to record the historic battle. Of note, Master Sergeant Gribenas spent several days with the lead elements of paratroopers entering the city of Musa Qaleh. Sergeant Wiegand flew with an aircraft recovery team that recovered a U.S. Air Force helicopter, and Major Hanselman participated in multiple combat flights with U.S. aircrews, taking direct enemy fire on several occasions. One of those dangerous aerial resupply missions took Hanselman into a contested landing zone in the jumpseat of a CH-47 Chinook helicopter. As the two aircraft attempted to get into the tight landing zone, enemy personnel popped out of tunnels in the side of a cliff and fired a rocket propelled grenade (RPG) directly at the vulnerable helicopter. Other enemy personnel opened up with machine guns as the aircraft maneuvered through the fire. Hanselman managed to videotape the attack on their aircraft and captured the incredible skill of the pilots who maneuvered to avoid the head on rocket attack. The memorable mission also included an Apache helicopter pilot getting wounded by anti-aircraft fire while he supported the Chinooks attempting to land at the hot landing zone. Just two days later, Hanselman joined Gribenas on the ground, and although the two soldiers never saw one another in the field, they continued to document the combat operations of the paratroopers who worked to clear the contested town of enemy influence. Gribenas pushed into the town with the lead elements of the paratroopers and documented key leader meetings with U.S. forces, British officers, and Afghan elders and military personnel. Hanselman returned to Kandahar Air Base from one ground combat mission with his own prisoner of war, a first for any MHD. January 2008 took the 305th into the area covered by the 4th Brigade Combat Team, 82d Airborne Division, when the team flew to FOBs Salerno and Sharana to cover the 782d Brigade Support Battalion. 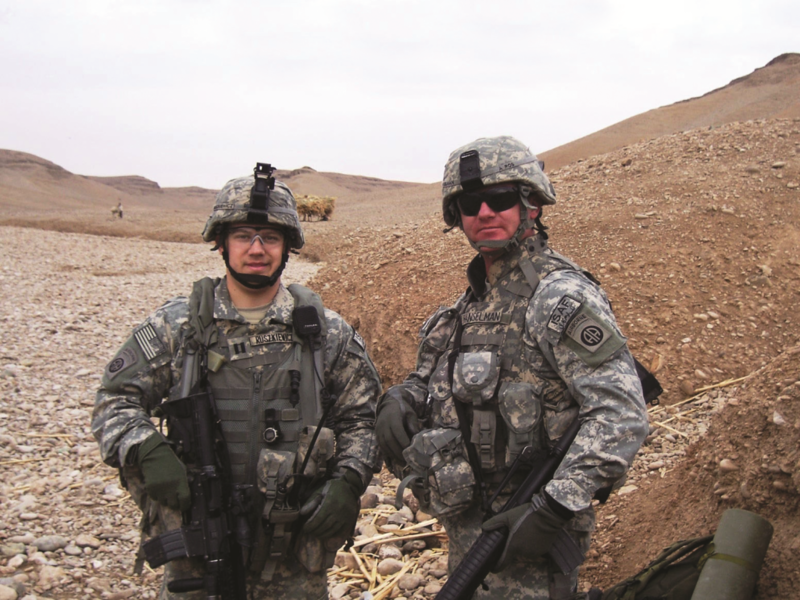 While covering the troops at Salerno, Sergeant Wiegand earned the detachment’s third Combat Action Badge when the base was struck in a rocket attack. The incident marked her fourth time under indirect fire from the enemy. Over the first four months of 2008, the 305th conducted multiple missions to bases throughout Afghanistan. The 305th’s soldiers documented the transfer of authority between the 82d Airborne Division and the 101st Airborne Division (Air Assault) and covered the activities of the Psychological Operations Battalion, Task Force Paladin, and other units working their way through Bagram. In April 2008, the 305th set out for an extended field mission and spent the next three weeks covering Operation Rock Penetrator, once again in the northeastern mountains with the 173d ABCT. 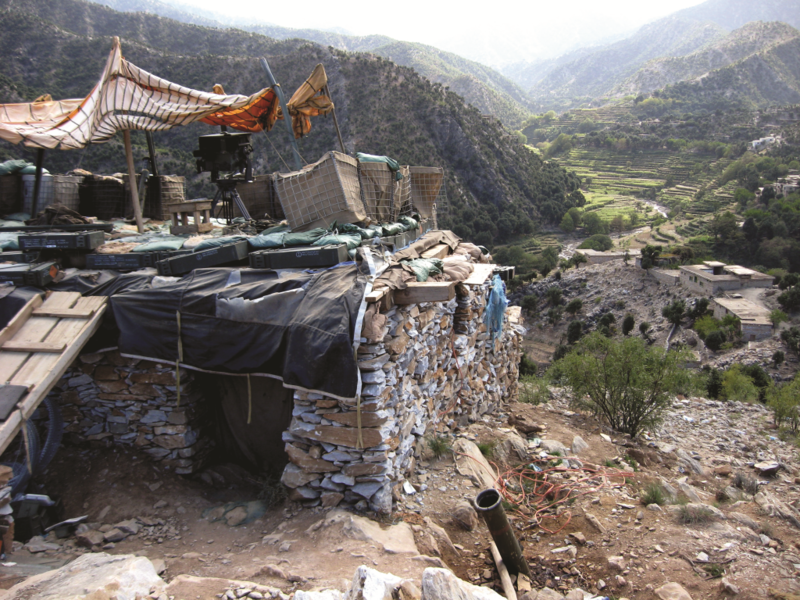 This mission took the team into familiar areas such as the Kunar Valley, Nuristan Province, outposts such as Blessing, Michigan, Able Main, Asadabad, and the Korengal. One mission took Master Sergeant Gribenas on a marathon convoy that traveled to no less than five different bases in the Nuristan and Kunar River Valleys. Major Hanselman and Sergeant Wiegand flew back into the Korengal Valley to visit Battle Company, 2-503d Parachute Infantry, and document how things had progressed in this heavily contested region. By spending several days with the troops in this remote combat outpost, the MHD soldiers were able to earn the respect and trust of the combat troops and collect valuable information from all ranks in the company. The team collected history on the current operations, as well as past operations that involved heroic actions from U.S. forces, including actions that earned recommendations for numerous Silver Stars, Bronze Stars, Purple Hearts, and one Medal of Honor recommendation. Major Hanselman joined Civil Affairs soldiers that were part of the Kunar Provincial Reconstruction Team (PRT) as they rolled into the Chowkay Valley to inspect several projects designed to bring stability and commerce to the Afghan villages throughout the valley. The mission took the small force into several villages that had been deeply influenced by Taliban insurgents only months before. As the team inspected a large bridge project, two medical clinics, a school and several smaller projects, the efforts of the “non-kinetic” fight became evident. Danger was ever present and U.S. forces working along the Chowkay Valley road took sporadic fire, but the change in the local population and their support for the Afghan government was evident in the progress of U.S. efforts to help build an infrastructure in this remote valley. In all, the 305th MHD traveled to thirty-one different bases, collecting 379 interviews totaling over 325 hours of first-person histories. Over 8,500 photographs and 3,000 documents were collected to add to the historic archives of the U.S. Army. What is unique about the 305th’s efforts is that not only was the collection sent to the U.S. Army Center of Military History, standard procedure for all MHDs, but the team maintained contact with multiple historians within the U.S. Army and provided information direct from the battlefield to other agencies within the Army. These other agencies included the Center of Army Lessons Learned, Combat Studies Institute, Army Heritage Center, Training and Doctrine Command, Forces Command, and historians from Infantry, Aviation, Transportation, and nine other branches within the Army. Members also worked with Special Operations Command, the Marines, Air Force, and Navy, which conducted joint operations with the Army. The information collected by the 305th was compiled by Major Hanselman, who included observations from the team to develop branch-specific files to provide branch historians valuable information that would find its way into classrooms even before the 305th had redeployed home. For the first time in MHD operations, the entire Army historical community benefited directly from such efforts. The 305th MHD redeployed in August 2008 after earning its second campaign streamer and was replaced by the 102d MHD of the Kansas Army National Guard. The soldiers of the 305th MHD and other teams like them dedicated themselves to the history mission for the U.S. Army by placing themselves in harm’s way in order to document combat operations. At the conclusion of this most recent deployment, the 305th has been submitted not only for its second combat streamer and numerous personal awards, but also for the Joint Meritorious Unit Award by the 82d Airborne Division and the Meritorious Unit Citation by the 101st Airborne Division (Air Assault). The Army Reserve will present the 305th with a combat unit streamer for having 100 percent of its soldiers decorated with the Combat Action Badge. The 305th MHD is a small unit compared to most, but it has been called upon for every major event that the Army has been a part of since 11 September 2001. It is the most deployed MHD in the U.S. Army, and the soldiers of the 305th have remained with the unit through it all, due to their dedication to their mission and to the soldiers whose history they hold.